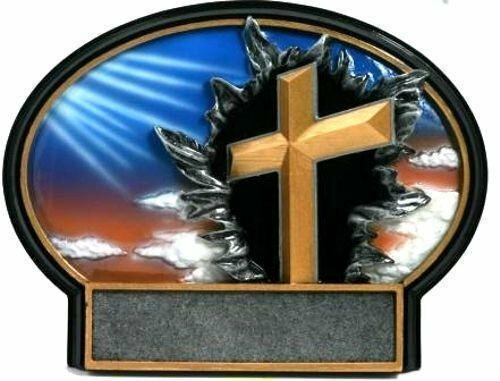 The Christian Trophies category contains a series of popular Christian trophies and plaques often presented to church members and members of other Christian organizations. These Christian awards are great for Bible bowls, Awana awards, upward volunteers, Sunday School teachers and pastor appreciation. 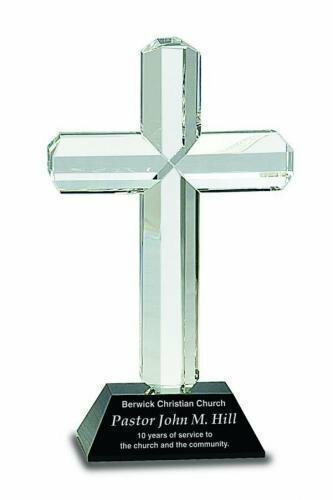 On your Christian trophy, we can custom engrave your churches logo and/or add a bible, praying hands, cross or other Christian artwork. FREE Shipping on orders over $100. FREE Engraving. 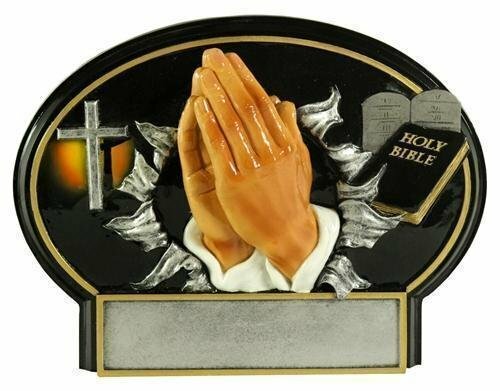 This cherry finished plaque has a black brass plate with a Bible theme. The Bible Plaque is a perfect Christian award. It can be used for church volunteers, Sunday School teachers and for Pastor appreciation. 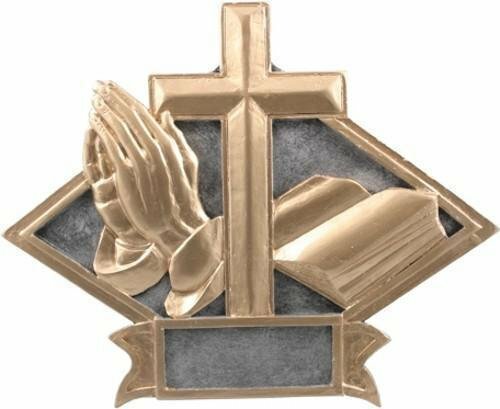 The Bible plaque is also ideal for Awana, RA and GA Christian education accomplishments. This cherry finished plaque has a black brass plate with a Bible theme. The Bible Plaque is a perfect Christian award. It can be used for church volunteers, Sunday School teachers and for Pastor appreciation. 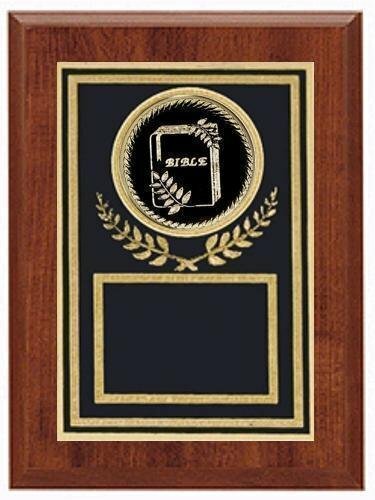 The Bible plaque could is also ideal for Awana, RA and GA Christian education accomplishments. This award plaque is laser engraved. Your logo can usually be engraved on these wood plaques at no additional cost provided that vector artwork or a high quality black and white image is uploaded during checkout. This cherry finished plaque has a black brass plate with a Christian Cross theme. The Christian Cross Plaque can be used for church volunteers, Sunday School teachers and for Pastor appreciation. The Christian plaque could is also ideal for Awana, RA and GA Christian education accomplishments. This award plaque is laser engraved. Your logo can usually be engraved on these wood plaques at no additional cost provided that vector artwork or a high quality black and white image is uploaded during checkout. 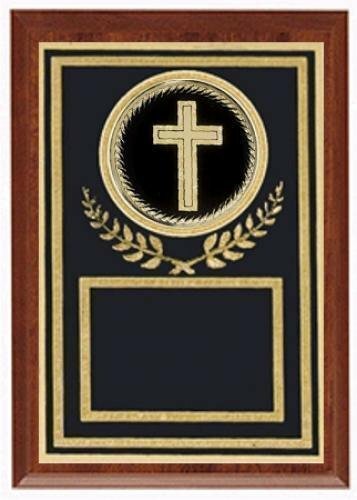 The Christian Cross Plaque has a cherry finished plaque with a Christian themed black brass plate. The Christian Cross Plaque can be used for church volunteers, Sunday School teachers and for Pastor appreciation. The Christian plaque could is also ideal for Awana, RA and GA Christian education accomplishments. This award plaque is laser engraved. Your logo can usually be engraved on these wood plaques at no additional cost provided that vector artwork or a high quality black and white image is uploaded during checkout. FREE Shipping is provided on orders of corporate awards over $100. FREE Engraving is included on all business awards. 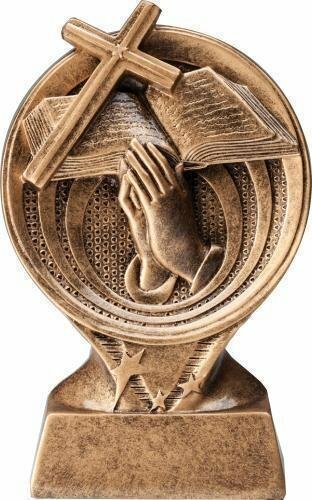 This cherry finished plaque has a black brass plate with a praying hands theme. 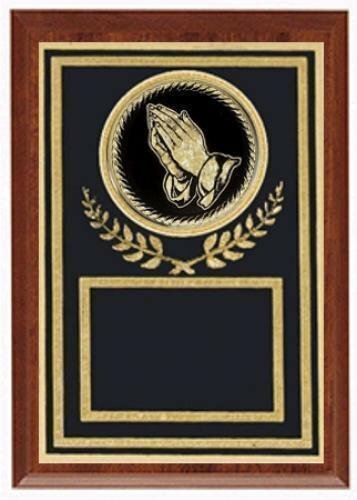 The Prayer Plaque is a perfect Christian award. It can be used for church volunteers, Sunday School teachers and for Pastor appreciation. The Bible plaque could is also ideal for Awana, RA and GA Christian education accomplishments. This award plaque is laser engraved. Your logo can usually be engraved on these wood plaques at no additional cost provided that vector artwork or a high quality black and white image is uploaded during checkout. The Books Of The Bible Bookmark is an inexpensive Christian bookmark that can be given to church members, visitors and others you want to minister to. The top and bottom edges are pinked. Books Of The Bible Bookmark Ribbon - 2.5" x 9"
The Burst Thru Christian Award is a popular choice. This Christian award can stand alone or be hung on the wall. The resin trophy includes a brushed silver plastic plate with up to 3 lines of black laser engraved letters. The Easter Bookmark is an inexpensive Christian bookmark that can be given to church members, visitors and others you want to minister to. An image of Jesus is on top. The words are "Easter is God's gift of life to all people ...". The top and bottom edges are pinked. The Father's Day Bookmark is an inexpensive Christian bookmark that can be given to church members, visitors and others you want to minister to. The title is "WHY GOD MADE FATHERS". The text reads "God knew that children all would need someone secure and strong to shelter and protect them and to teach them right from wrong... Someone to take pride in and to look up to as a guide, someone they could count on and in whom they could confide... He knew as children grew, they'd need the reassurance of someone with faith and trust in them, who would always give them love ..." The bottom says "HAPPY FATHER'S DAY". The top and bottom edges are pinked. One night I dreamed I was walking along the beach with the Lord. Many scenes from my life flashed across the sky. In each scene I noticed footprints in the sand. Sometimes there were two sets of footprints, other times there were one set of footprints. This bothered me because I noticed that during the low periods of my life, when I was suffering from anguish, sorrow or defeat, I could see only one set of footprints. So I said to the Lord, "You promised me Lord, that if I followed you, you would walk with me always. But I have noticed that during the most trying periods of my life there have only been one set of footprints in the sand. Why, when I needed you most, you have not been there for me?" The Lord replied, "The times when you have seen only one set of footprints, is when I carried you." Footprints Bookmark Ribbon - 2.5" x 9"
How To Use The Bible Bookmark Ribbon - 2.5" x 9"
Love Bookmark Ribbon - 2.5" x 9"
Luke 11:9-10 Bookmark Ribbon - 2.5" x 9"
keep you ever in His care. The Next Gen. Christian Trophy is impressive. With a high level of detail, this softball award is sure to wow its recipients. 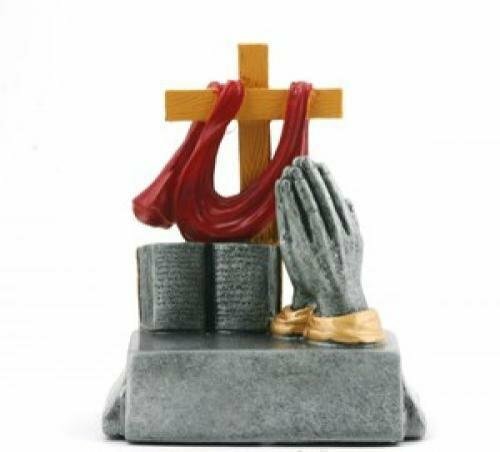 This Christian trophy can be hung on the wall or stand alone. The Christian resin includes a brushed silver plastic plate with up to 3 lines of black laser engraved letters. The Psalm 121 Bookmark is an inexpensive Christian bookmark that can be given to church members, visitors and others you want to minister to. The top and bottom edges are pinked. Psalm 121 Bookmark Ribbon - 2.5" x 9"
The Psalm 23 Bookmark is an inexpensive Christian bookmark that can be given to church members, visitors and others you want to minister to. The top and bottom edges are pinked. 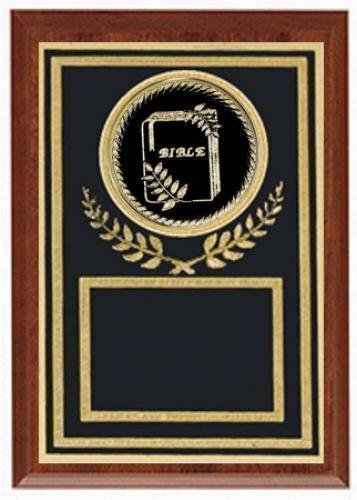 Psalm 23 Bookmark Ribbon - 2.5" x 9"
The 3D Motion resin Christian trophy has a brushed gold laser engraved plate with black letters. 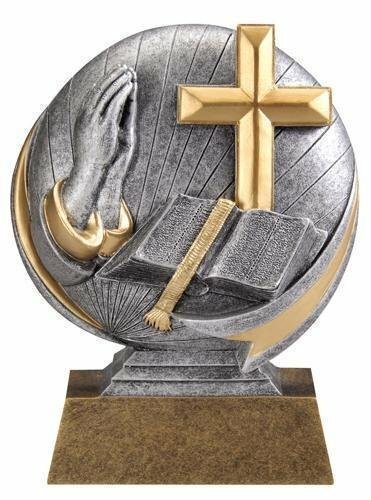 This Christian award is an inexpensive trophy with great character. An Elegant Diamond Christian Sport Award that can be a Desk Accessory, Mounted on a Plaque or on a Wall. This Christian award is a great way to recognize anyone on exceptional character! Engraving is free. The Saturn Christian Trophy design puts fun trophies in a new orbit. Give these Christian awards to commemorate a fun season or celebrate achievement. These Christian trophies are an economically priced. 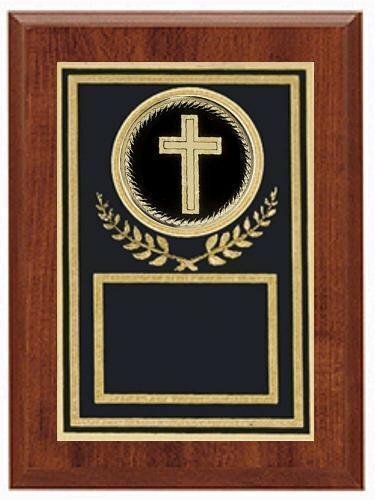 Each Christian award comes with a brushed gold plastic plate with laser engrave black lettering. The Wreath Christian trophy has a beautiful pewter and gold finish. 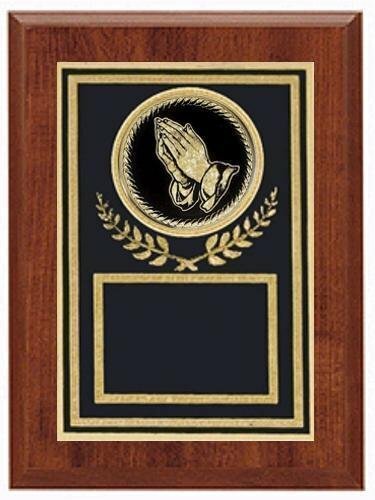 This Christian award comes with a laser engraved brushed gold plastic plate. This stunning crystal cross is beveled on each edge to create dimension and catch the light. 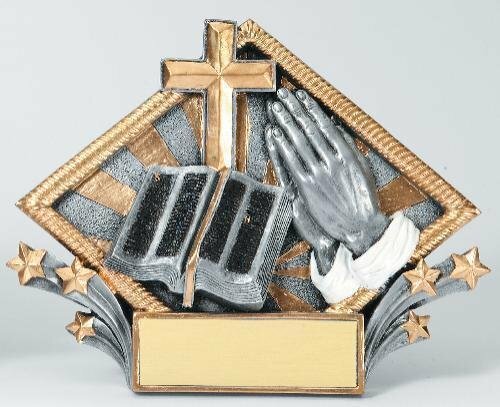 Mounted to a black crystal base, it can be personalized to honor achievement or milestone events in your Christian organization. The cross is packaged in a beautifully lined box for added elegance.